I have just seen the coolest thing in the wine world. It's a game changer. I have to tell you I've seen the future of wine. I have just seen the coolest thing in the wine world. It's a game changer. I have to tell you I've seen the future of wine. The Coravin "wine access" system is going to change how wine is served and consumed in restaurants, wine tasting rooms and at home. Wine's biggest enemy is oxygen. Once you open a bottle, air gets into the bottle and starts to oxidize it, no matter how much air you try to pump out or displace by squirting inert gas into the bottle then stoppering it. After day two, most wines loose their freshness, and by day three or four forget it. This is a major issue for restaurants and wine bars serving by the glass, and it impacts you, the wine drinker. When was the bottle opened? Hopefully within the past hour, not a day or two ago. How long do most restaurants and bars keep opened bottles? Two days? Five days? A week? Sometimes it tastes like it's been more than a week. I first got wind of the Coravin at The Press Club in San Francisco. Wine Director Mauro Cirilli was one of four wine professionals testing out the gadget. Others were being given a trial run at Aquellero (also in SF) and Del Posto and Eleven Madison Park in New York City. Mauro developed a by the glass program to highlight some very very nice bottles of wine out of magnum. Have you ever heard of by the glass from a magnum? Me either, unless there was a special offer going on. The risk of the wine oxidizing before you could sell all of it is too great. And we're not talking just one magnum, Mauro was pouring from about 30 magnums, getting about 10 glasses per magnum. The wines included current and new releases of white Burgundies -- Corton-Charlemagne, Chassgne-Montrachet -- and Barolos, Brunellos, Napa Cabs and St. Emillion Bordeaux. Why magnums? Mauro says the quality of the wine, especially aged wines is better, and also a great test of the Coravin's promise of keeping wine fresh over not just days, but weeks and months. What's that you say, weeks and even months? Yes. I didn't believe it but it's true. We tried a 2004 Tinto Pesquera Reserva Ribero del Duero. It was fresh, with high acid, lots of fruit and dusty tannins. It had been opened for weeks. The 2005 Corison Cabernet Sauvignon, also opened weeks ago, was still very fruity and fresh, with a layered complexity. When I say "opened" I should really say "accessed." That's because the cork never comes out of the bottle. In fact the capsule is never removed from the bottle. 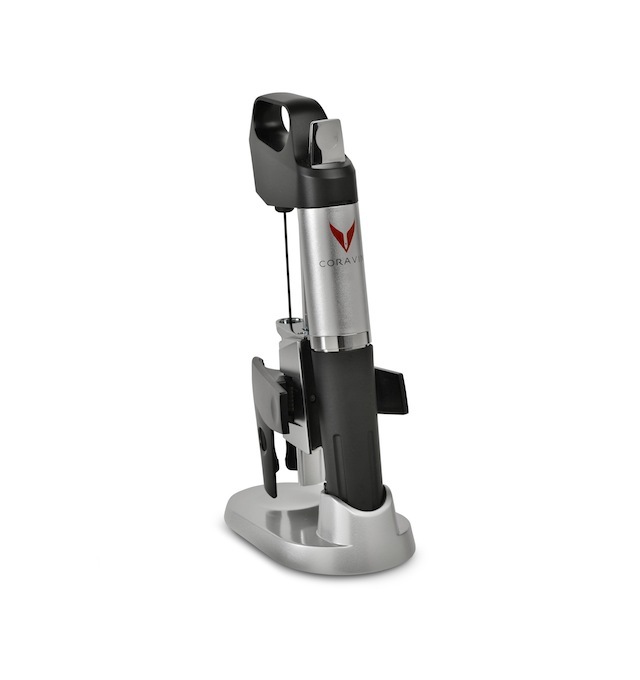 The Coravin device looks a bit like a rabbit corkscrew opener, but instead of a worm, there is a long, skinny, hollow teflon needle that goes through the capsule and pierces the cork all the way through. At the end of the needle there are holes through which the wine travels into your glass. They way the Coravin folks explain it, once the needle goes through the cork, inert argon gas pressurizes the wine bottle. This pressurization gently pushes the wine into the needle when you're tilting the bottle to pour it. Thanks to the gas, oxygen never enters the needle or the bottle. Once you pull the Coravin away from the bottle, the cork naturally seals up the hole created by the needle. The Coravin is pretty easy to use too. More recently I had a demo where I got to try it out. Once the Coravin wraps arund the wine bottle neck, you press down on a handle (which comes in useful when pouring) to plunge the needle into the cork. When you are ready to pour you press a button to release the argon gas. The wine comes out slowly, but it's easier to control that way. 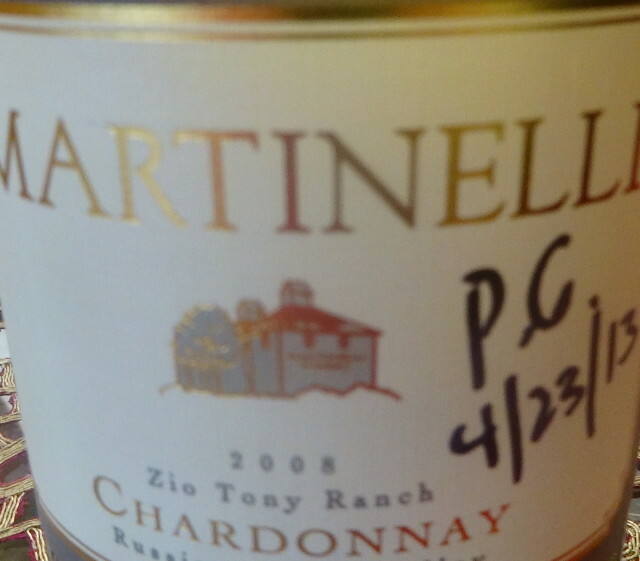 I tasted two wines during this demo, a 2008 Martinelli Zio Tony Ranch Chardonnay and 2008 Hall Cabernet Sauvignon, both first "accessed" on April 23, 2013. The taster that day was Master Sommelier Peter Granoff. I was tasting on August 1, 2013. Once again, both wines were incredibly fresh, with bright fruit and no sign of oxidation. I must get one of these! Imagine the possibilities. You can have whatever glass of wine you want, when you want it, without worrying about how to save it, or having to find others to share that bottle with. If you have a dinner party, you can serve each guest a wine that they like, without having to open several bottles that you'd either have to consume. or pour down the drain a few days later. Imagine the possibilities for restaurants and wine bars. They can offer more by the glass selections and you may be able to try wines you'd never have the chance to before. Old Burgundies and Bordeaux and other rare wines. Sure you might be paying $30 to $50 a glass to try some legendary wines, but think of the savings versus paying hundreds or thousands of dollars to do so. Wineries could offer more library wines in their tasting rooms, or have a larger selection of their current release wines for you to try. The only wines a Coravin can't access are sparkling wines, and most likely it's not going to work on a synthetic cork, and it will not work on a screwcap or glass top. But it can pierce the foil and even a wax seal. Once you've accessed the wine, continue to store it properly and it should continue aging and developing in the bottle. After many tests, it seems leaking is not an issue, and that's a good sign that the cork did indeed seal right back up. The device works with argon cartridges, very similar to what you'd use with one of those instant whipped cream makers. Each cartridge is good for about 15 glasses of wine. Coravin is the brainchild of Greg Lambrecht who is a medical device creator. His passion for wine led him to look for a solution to being able to have a glass of wine without worrying about having to drink it within a day or two before oxidation set in. He figured there must be a way to solve this dilemma through technology. It took him about 10 years to develop Coravin. In fact this wine gadget has that surgical precision aspect to it. Greg's invention is already changing wine service, and will continue, I predict, to have a major impact on the wine industry. Did I mention wine guru Joe Bastianich is not only a fan but also an investor? You can have your own Coravin at home, it will set you back $299, and it comes with two argon capsules. I haven't done the math but just thinking about the wine you'll be able to enjoy without wasting any of it is a pretty good justification for investing in the coolest wine gadget ever.